Autonomous Underwater Vehicle (AUVs) are unmanned, self-propelled vehicles that are typically deployed from a surface vessel and can operate independently of that vessel for periods of a few hours to several days. This project discusses the development of an autonomous underwater vehicle (AUV) to detect an object underwater through a vision sensor. In this project, the horizontal motion of the AUV is controlled by two thrusters which are placed at the side of the AUV with the guidance of a digital magnetic compass to control the direction of the AUV. The vertical motion of the AUV is controlled by a thruster located in the middle of the AUV with the assistance of a depth sensor to ensure the AUV stays submerged underwater. A Pixy CMU cam5 is used as the vision sensor of the AUV with the function of detecting an object underwater through its specific colour code. When the sensor detects an object, the AUV automatically moves towards to the object without requiring any operator. The AUV is tested in a swimming pool to test its ability to stay submerge underwater as well as its functionality to navigate and detect object underwater. 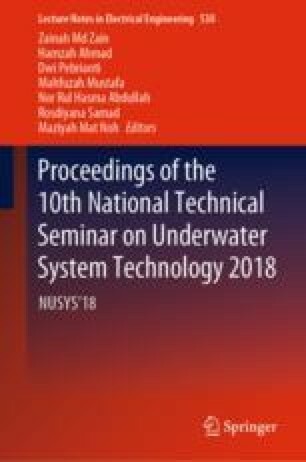 The simulation and experimental results show that the AUV able to operate and acquire targets successfully.